Our only criticism would be needing more toilet paper and towels. This bright and impressive penthouse stands on three levels. It offers a space which will make your stay as unforgettable as possible. 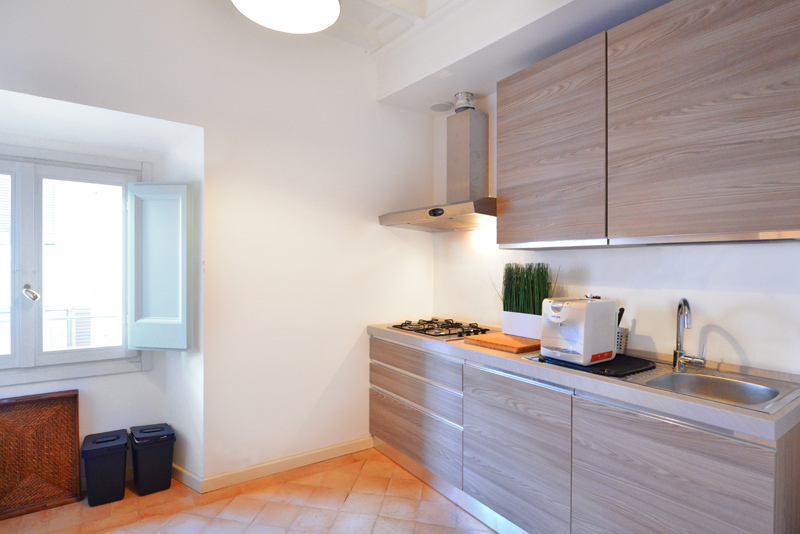 Moreover, your home in the Eternal City has everything you need to experience Rome at its best. 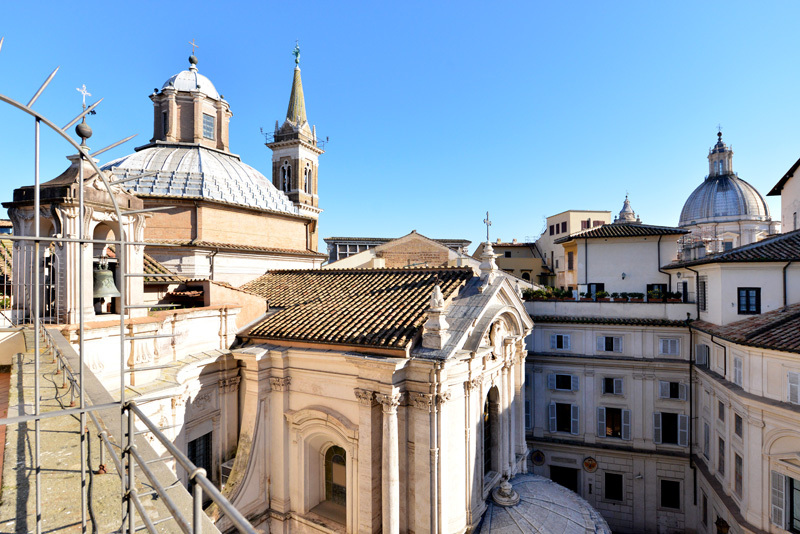 For instance, its private terrace will offer wonderful views over the Chiostro del Bramante. 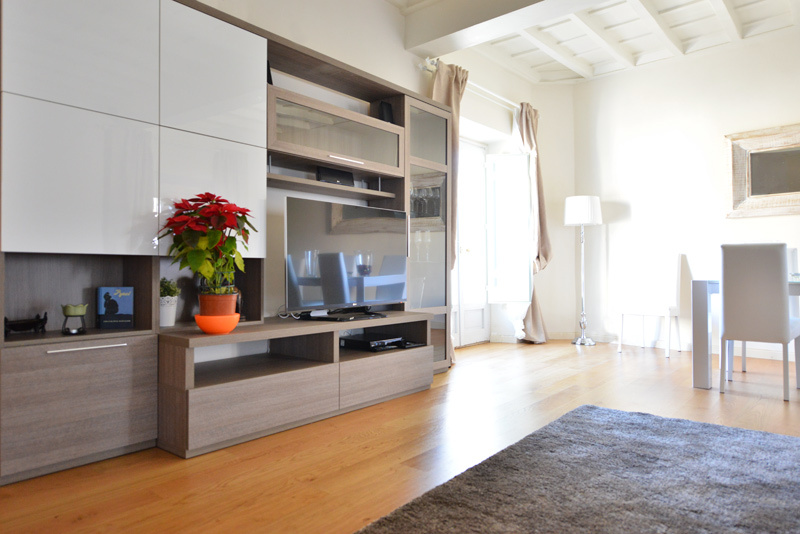 The living room offers a wide space and features an elegant parquet floor and high wooden ceilings. The fully equipped entertainment corner provides a flat 48″ TV, a DVD player, Wi-Fi Internet, a Dolby surround system, and also very comfortable double sofa-bed. 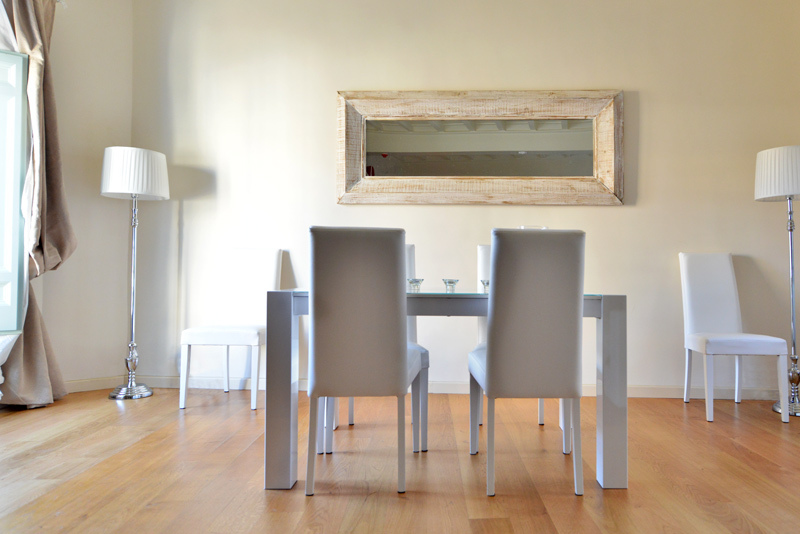 Right by the living area, you’ll find a large dining table with six chairs and all the necessary flatware and tableware you may need to enjoy a nice meal at home. Going from one room to the other, look out the windows and see the amazing views over ancient rooftops! The master bedroom has a king size bed, night tables, night lamps and wooden wardrobes. 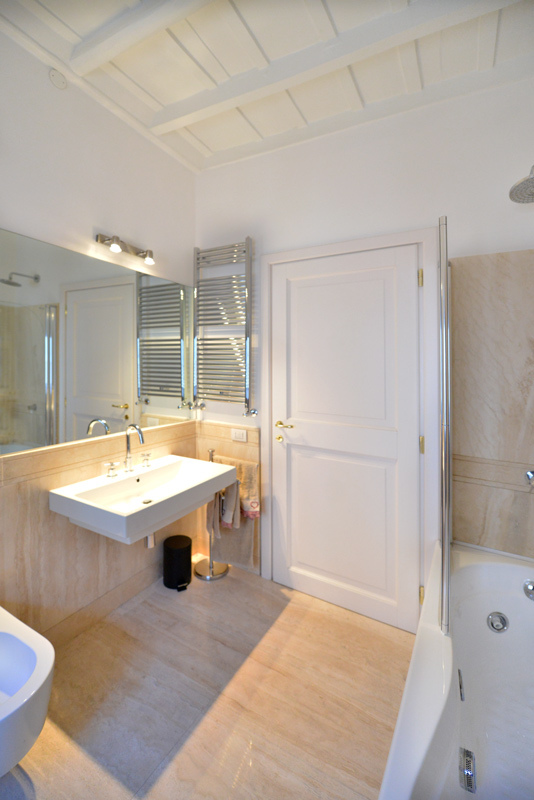 Next to it, you will find a stylish bathroom complete with a bathtub. The modern, fully-equipped kitchen offers a gas stove, an oven, a refrigerator, a freezer, a dish washer, a washing machine, a tea kettle and a capsule coffee machine. On the second level, you will find another room with a comfortable double sofa bed. This space offers enchanting views from its windows and access to the terrace. 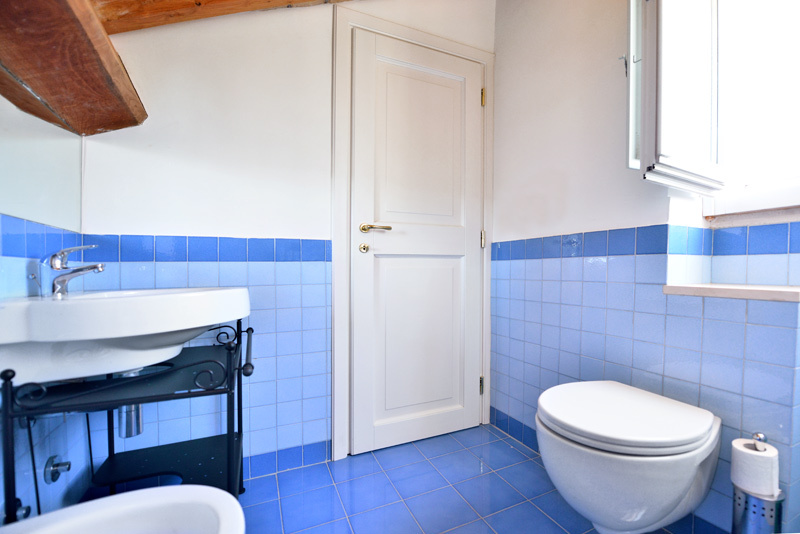 This same level also has a second blue-colored bathroom with a shower. Finally, the third and last level is made up of a cozy attic room with large windows with more views and a single day bed. 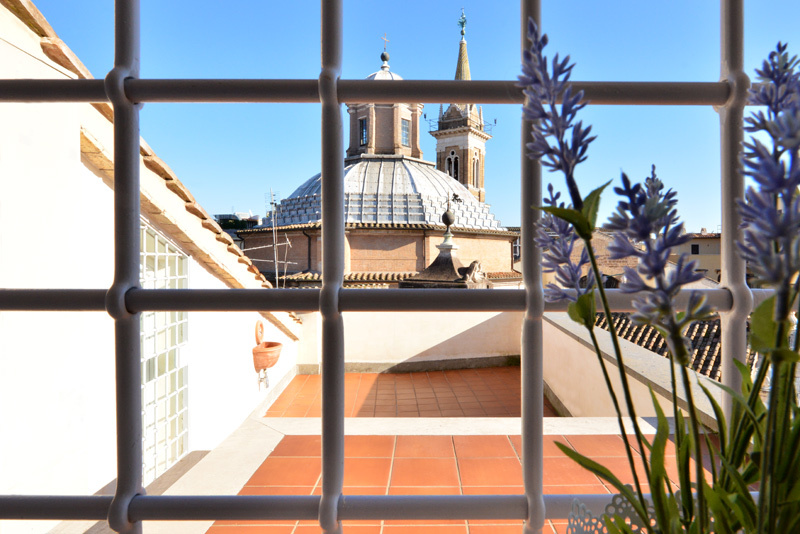 We recommend this air conditioned Rome penthouse with stunning views for romantic and special stays. You’ll be glad to call this place “home”. 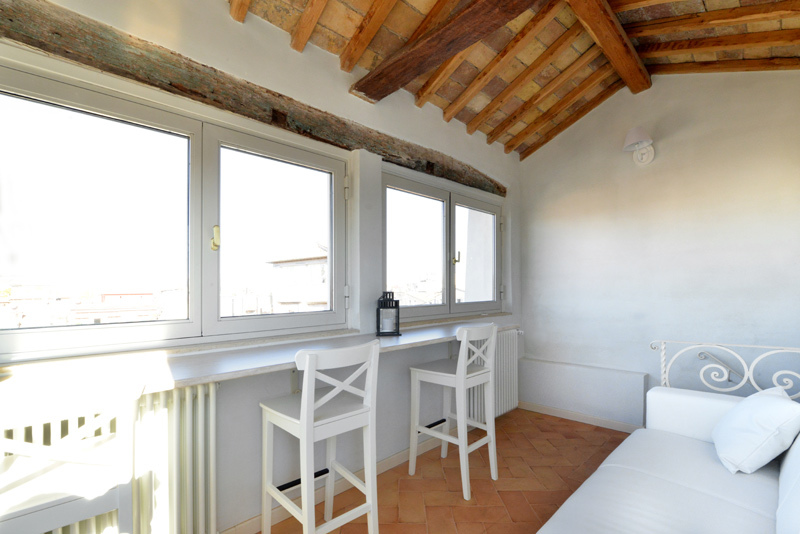 Just a stone’s throw away from the Piazza Navona, this is as central as an apartment can get. From here you will be able to walk to all attractions in at most 30 minutes. These include the Vatican to the Northwest, Piazza del Popolo, Spanish Steps, and Villa Borghese in the Northeast. Further East and towards the South you will find the Trevi Fountain, Pantheon, Piazza Venezia, Roman Forum, Colosseum, Giardino degli Aranci, and Jewish Ghetto. We would recommend heading towards the Trevi Fountain after dark. The later you go, the more the crowds will have thinned out. What is more, at night the fountain is lit up by some gorgeous and atmospheric illuminations. Heading out West across the river you will arrive in the characteristic and lively Trastevere. This is another lively and enchanting area in the evenings with many restaurants and tiny little streets. In addition to this, in the evenings, the surrounding area of this apartment is ideal. There are many different restaurants serving traditional Roman cuisine. After enjoying some ‘cacio e pepe’ or ‘supplì’, head to one of the many bars for a relaxed drink. People will moreover be spilling out onto the street, creating an infectious, friendly, and warm atmosphere. 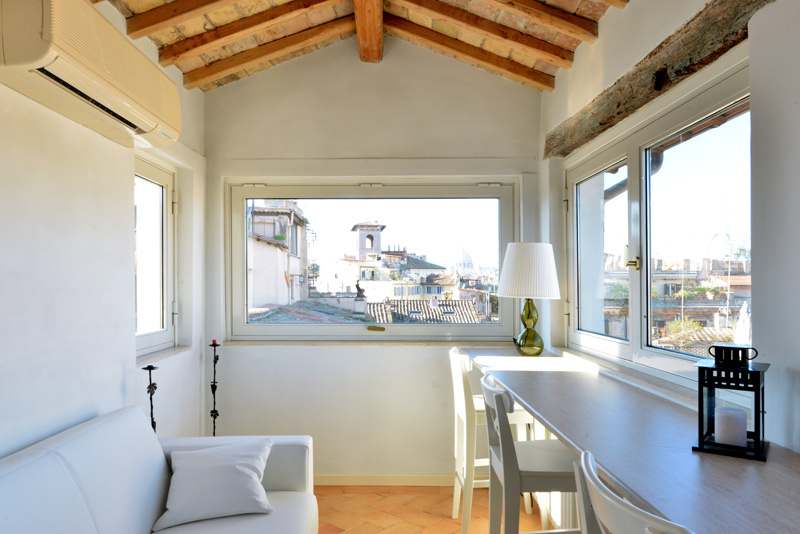 Despite the fact that a canceled connecting flight made us miss one of the three nights we'd booked at this beautiful Piazza Navona area apartment, our stay was outstanding! The airport pickup was seamless and the driver was charming, the apartment was JUST as advertised, with excellent air conditioning and wifi, in a PERFECT location. That it...Read More was so lovely made us doubly sorry we'd missed one of our three nights there. 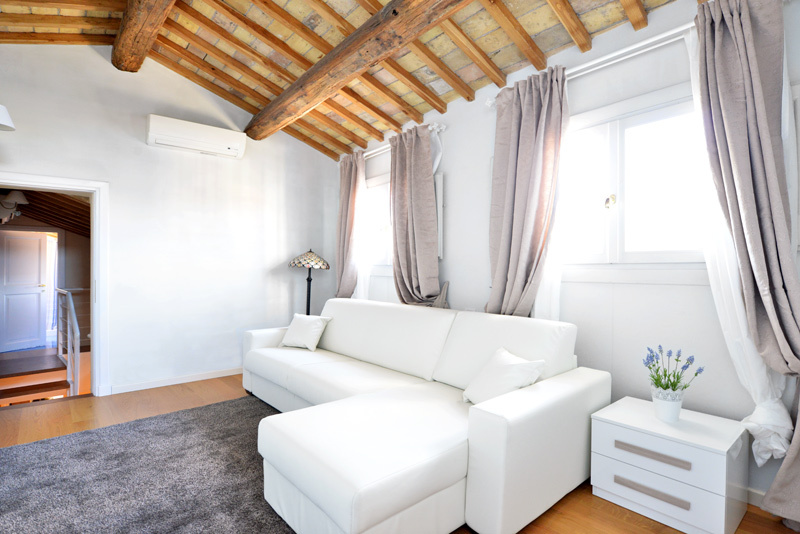 The furnishings in the apartment were VERY comfortable and charming and we would definitely stay there again and be happy to do business with RomeLoft for future trips. The staff was so helpful that they even called a taxi service for us to arrange transportation to the train station when we left because our Italian wasn't good enough to tell them what we needed! Viva, RomeLoft!!!! My husband and I met here at the apartment in Roma, after I had already been traveling solo for over 2 months. 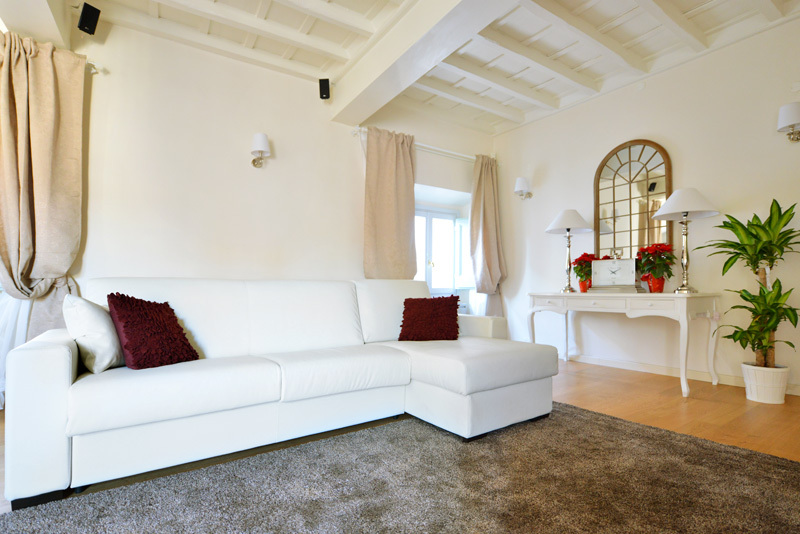 I'm pretty familiar with Roma and chose this apartment for both it's location as well as the pictures of it from your Website, and I had rented from RomeLoft before for a 5 week stay in Roma, and found the experience of rent...Read Moreing thru them to be very efficient and professional. I travel, mostly alone, for up to 3-4 months of the year, internationally, and then my husband will usually join me for up to 10 days of my stay ( wherever I am). I am very used to renting very nice apartments for up to 5 weeks at a time, so have rented A LOT of Holiday Apartments, all over Europe, and elsewhere. As a result, I am also very specific in my requirements for Holiday Rentals. There have been a few apartments that did not live up to their description and/or were not well maintained/ managed. THIS apartment was pretty GREAT. There were a few small issues, but overall, this apartment was a very much " Net Positive ". The location, the square footage, the comfort of furniture as well as beds, and the over all cleanliness ( this is always a HUGE factor for me), and this apartment really had almost everything. There are a few things that didn't live up to the over all standards of the apartment: The Upstairs Blue Bathroom : the shower and shower curtain were very moldy and need to be much better cleaned, and a new curtain should be hung. The one there is, gross ( really, it was disgusting, and I am always very specific about not finding mold/mildew in kitchen and baths, when ever I rent an apartment). The Kitchen is smaller than it appears, but pretty functional, although it could use a bit more work/ counter space ( when in Roma, it's nice to be able to prep and cook fresh meals). However, there wasn't even a can opener, toaster or microwave, and were I not such an experienced luxury holiday apartment renter, I wouldn't have had the following ( but for the fact that I travel with my own: can opener, kitchen towel, paper towels, new clean sponge ( the one I saw that was under the kitchen sink was disgusting, so I am glad I always travel with one, just in case), garbage bags, and Saran Wrap /foil. The Bed in the Master, was extremely comfortable, the pillows, not so much, but I also travel with my own washable pillow ( " My Pillow " : Lavender seamed brand). I travel with a large assortment of adapters for various electrical cords ( laptop, iPad mini, I phone, kindle) + extra cords...and would have been in a bit of trouble if I didn't, as I saw that there were none in the apt, that I could see. There are no English TV Stations, Not even any of the International News Stations like CNN or Sky. In fact, there are very limited TV options to watch, but hey, I did get to watch a 1940's Classic: Rita Hayworth and Glen Ford in " GILDA " in Italian, and that was a treat There were, however, 2 very nice quality and full sized umbrellas to use ( it never rained while I was in Rome this trip, but it was early July, and was unusually HOT ). Despite having a sun hat, I carried one of the umbrellas, all the time, to give some relief from the sun, during the long, hot days of summer. The Air Conditioning was by room units with remotes, and they all worked blissfully well. There was both plenty of light when the shutters were open on the windows, and good privacy when they were closed, as you can really look into other apartments with these old buildings being so close to one another. The Apartment is very spacious--- really quite big and very comfortable, with minimal street noise at night, even though it's in an excellent location with lots of Pedestrian traffic every where around it. Also, quite near to great shopping/ antiquing and a huge range of dining options, from fine to casual. The check in was very easy and pleasant. Nassir ( property manager) and Alan ( apartment cleaner ) were great, and the driver that I contracted with via the RomeLoft company, HONEY, was beyond great. He was very friendly, courteous, professional, informative and helpful...really, I cannot say good enough things about Honey, he welcomed me to Rome, and then saw me off on a very early morning, and was just a Prince of a Man. So this is already pretty long, and I will sum up that the Aparment was an excellent choice and very enjoyable, and would highly recommend it as a rental option for Roma, particularly if you are like us, and would rather walk everywhere in town and not have to rely on taxis/ mass transit. We had a fabulous holiday in Rome and the location and the apartment were just what we needed. Just a couple of points- we were a party of 4 adults and there were only 3 chairs in the upstairs loft area. Also we couldn't understand why the taxi transfer we booked back to the airport couldn't drop our son at the railway station on the way....Read More We would have been prepared to pay extra, but €35 for an extra taxi seemed very expensive. My son used the taxi service that was suggested in the apartment. However, on the morning we departed there was a huge thunderstorm as we were leaving and the taxi for my son did not turn up, nor did they answer when they rang. They ended up walking in the rain and worried about missing their train. This was a very stressful end to an otherwise fabulous few days. We would suggest that you change the taxi company for future visitors. However, we would definitely use Romeloft again and would recommend it to others. 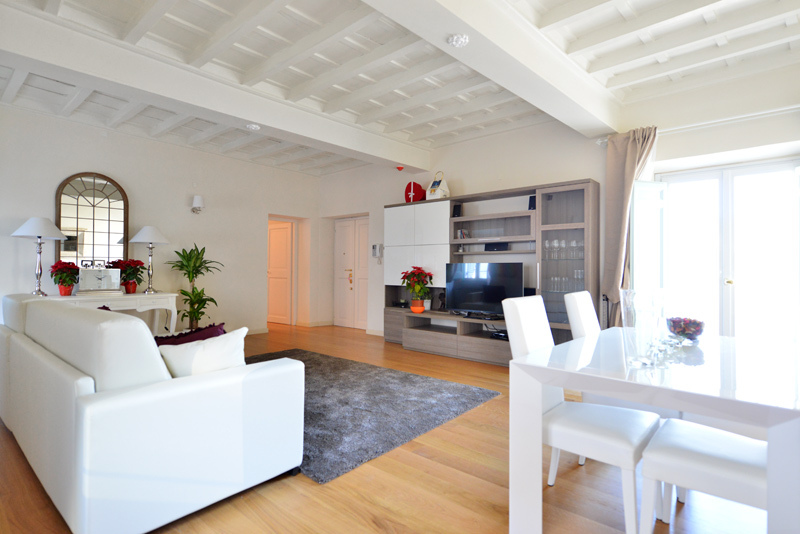 We absolutely loved the Bramante elegant apartment! It is listed as a 1 bedroom, which is true, but there are 2 living rooms with sleeper sofas, so we had plenty of room for our 3 children. 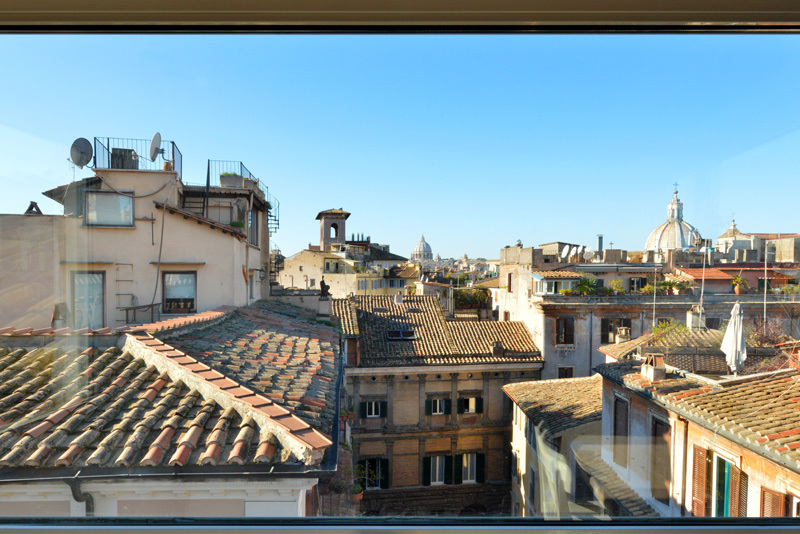 The attic room has a view of St. Peter’s, which was beautiful at sunset. We loved sitting on the terrace where we enjoyed music from the street below. 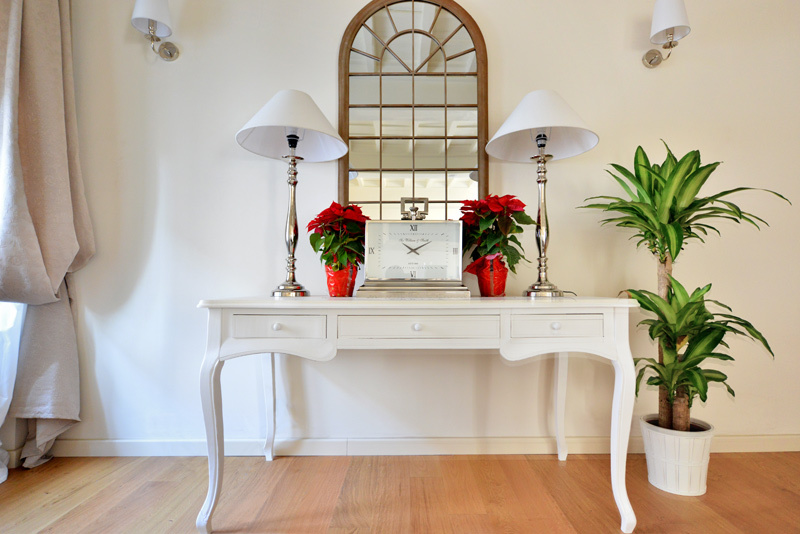 It ...Read Morehas modern décor and is clean. It is on the most charming cobble-stoned street, with restaurants frequented by locals (try Focaccia right next door). We walked everywhere in Rome: to St. Peter’s, to the Colosseum, to the Spanish Steps, from this very central location which is steps from Piazza Navona. 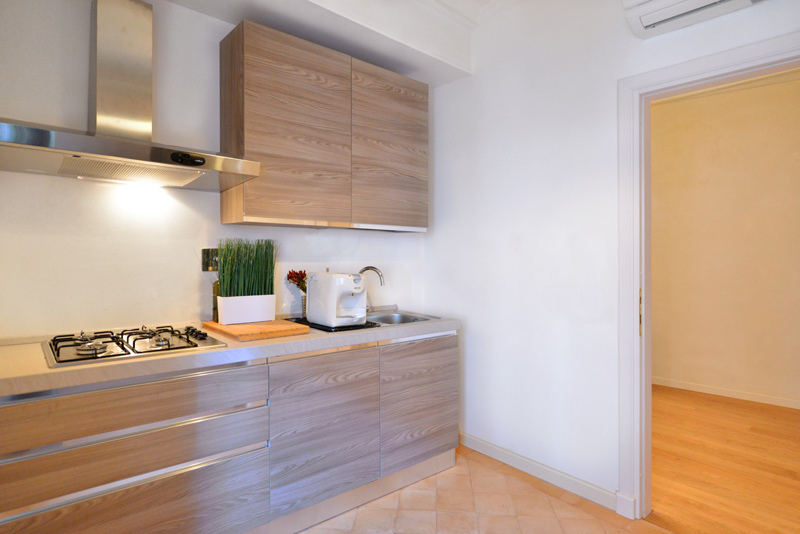 We would definitely stay here again and recommend this apartment to anyone coming to Rome. The staff at RomeLoft was very responsive. I knew from how promptly my emails were responded, that we would be in good hands. Our transfers that we booked through RomeLoft were reliable, on time, and trustworthy. Grazie Rome Loft!